All the meditations of Kadampa Buddhism come from Conqueror Vajradhara and the great Secret Mantra Masters of ancient India. 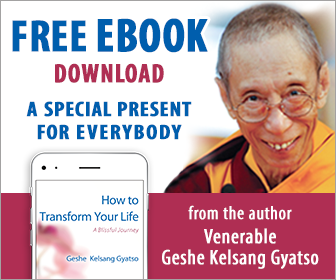 These techniques were passed from the Indian Masters to the Tibetan Masters, and have been handed down to the present-day Teachers in an unbroken lineage from spiritual Father to spiritual Son. Although Mahamudra meditations were practiced by the ancient Indian Masters, the particular system of Mahamudra presented here is a ‘close’ lineage transmitted by Conqueror Vajradhara to the Wisdom Buddha Manjushri, who in turn transmitted it directly to Je Tsongkhapa. Thus Je Tsongkhapa was the first human Master in this particular lineage. In recent times, this lineage was held by Trinlay Gyatso, more widely known as Phabongkha Rinpoche, who was an emanation of the Tantric Deity Heruka. This great Lama was like the sun of Dharma, illuminating the hidden meaning of both Sutra and Secret Mantra. He passed the Mahamudra lineage to his heart Son, Yongdzin Trijang Dorjechang, and it is through the kindness and authority of this holy Spiritual Guide that this information is now available.